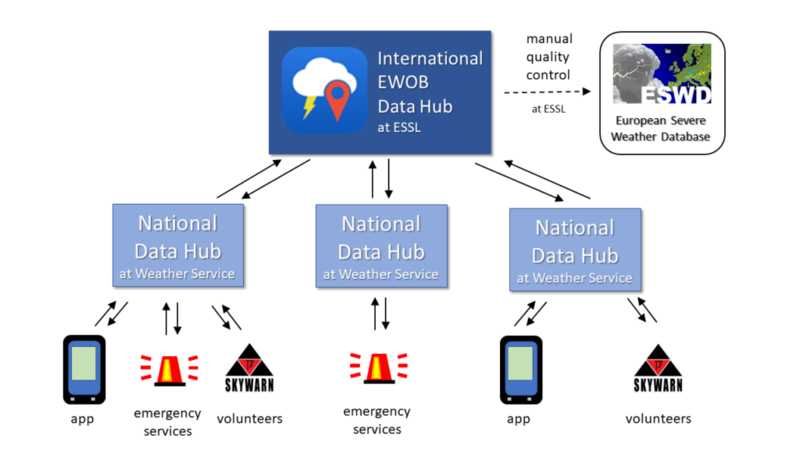 ESSL and a number of weather serives in Europe have initiated a collaboration to exchange crowd-sourced weather and weather impact reports. Weather Services in various countries collect weather reports from individuals, e.g. through the weather app that they operate, or from storm spotters or emergency services. These reports are uploaded in real-time to the EWOB database at ESSL, which acts as an overarching data hub. Reports from the international database are frequently downloaded by the participating Weather Services to ensure they also obtain reports from neighboring countries to complement their national report database. The international collaboration and the EWOB Standard for data exchange are governed by the EWOB Oversight Committee with delegates from all partners. The data are not checked for correctness, with the exception of data obtained by reliable sources such as spotters or emergency management. Thus, they differ from quality-controlled data, e.g. that collected in ESSL’s European Severe Weather Database. EWOB reports do not contain any personal identifiable data. The EWOB data exchange takes place using the EWOB API. The specification can be requested from ESSL at ewob@essl.org. Please also contact us here if you are a weather service interested in joining EWOB.